This is the Xlab Rocket Pocket (like a bento box). It’s small and contoured so that it wouldn’t slip or slide down or around the top tube while resting. It holds all the essentials like your keys, gels, bars, and IDs. The Xlab Rocket Pocket is good for use during training and during race day so that you’ll have access to what you need on the bike. Don’t want to put nutrition in it? You can also just use it to put tools in there if you prefer. The sky is the limit. See this and more Xlab products by going to the Xlab products page. Economical, budget minded, thrifty. Any way you word it the Louis Garneau Race Day Revo backpack gives access to top-tier features, found in other more expensive bags, while maintaining an entry-level price point. The Race Day Revo manages all of these extras while still showing off the usual assortment of side pockets and water-bottle holder. Constructed from extremely thin nylon, this race day bag is completely waterproof and collapsible to the point where you could just roll it up and pack it anywhere when not in use. The internal compartment doesn’t seem large, since the bag itself is smaller than most, however we managed to fit a 5 gallon water bottle inside with ease meaning that it will fit all of your race day gear, and then some. When you break it down the Race Day Revo’s weight is designed to be light (it won’t break your momma’s back) and when a problem comes along, the Revo whips it (whips it real good). At a triathlon transition where space is usually scarce, having a bag too bulky would make things much too difficult. One, you’ll likely peeve other people around you, and second, merely getting organized ends up being a more daunting task if you end up bringing too much to transition. This is why the Z-Pack is a great choice. Bring what you need to your training session or race day, so you can focus on what’s most important – your race. See how the Z-Pack compares for your needs to other Triathlon Bags. We’ve all made the same mistake and suffered similar chafing consequences and while we can’t all be “Slippery Pete’s”, the alternative to having a natural friction free sheen has been either BodyGlide or the new to market, TRISLIDE. Both of these products offer a silicone based formula so that it applies and stays where you want it to, forgoing the days of applying Vaseline or cooking spray which stains clothes, washes away with sweat and is just a generally messy experience. Having used both of the products I was impressed with TRISLIDE’s unique spray applicator approach and diminutive size that won’t hog a lot of space in your transition or gym bag. On the other hand, BodyGlide is every bit as functional as the new kid in school, TRISLIDE, and has more training years, chafe free miles and a tried and true race pedigree to its credit. You can’t go wrong with either, but without, you’re facing a not so slippery slope of painful swims and running workouts which will ultimately increase recovery time and as a result, an increase in race times. Pick up a stick or can and you’ll know what I mean. The Xlab Gorilla XT. If you’re riding on bumpier roads, or you’re paranoid of any bottles flying out your rear hydration systems, this is the cage for you! Designed for mountain bikers, this is Xlab’s highest grip carbon cage. Light, sturdy, tight, and tough, your bottles ain’t going anywhere anymore – meaning you can rest assured while going on the trails. Gone are the days of having to deal with one less bottle on the road or trail. The Gorilla XT cage installs quickly like any other cage. So go ahead, jump over that mountain lion, or that neighborhood cat and don’t even think twice about it. See this and more Xlab products on the Xlab products brand page. Looking for a Sleeveless Wetsuit? The Zoot Fuzion might be a great candidate in your search for your first or all around training triathlon wetsuit. Offering nine sizes, this wetsuit was designed to ensure a proper fit on different body types. A notable feature on this suit is that fact that it’s made with Yamamoto 39 cell neoprene. It’s the world’s most light weight and low-density rubber, making the suit extremely flexible, buoyant, and durable. This translates to more speed. The Fuzion also has a tapered collar line SCS smoothskin, which will help minimize chafing. An updated cuff construction seals out water, and helps with getting the wetsuit on and off, giving it a feature that many entry-level wetsuits do not have. The torso and thighs are 5mm, sleeve and underarms are 1.5mm, and in the legs between 3-4mm. See more Zoot Wetsuits offered. First compression sock I’ve ever tried. It felt like a sock. It looked like a sock. It did NOT act like a sock. I mean how complicated can these shoe liners get? So yes. I haven’t worn it in a race setting (it’s only been a week), but that’s what the Zoot compression sock is meant for; long-term performance / recovery benefits coupled with improved strike padding which results in a sock that will outlast whatever race you’re running in, no matter your level. The long sock: no longer a modern day Shark vs. Jet accessory but rather comes with added athletic/recovery specific benefits. Here we have the feminine Endurance Tri Tank by Zoot. It is a tri -specific top which is perfect for racing as well as training. It is composed of a nylon/spandex fabric featuring Endura technology. This technology is custom to specific Zoot items, allowing for optimum compression and muscle support, as well as reduces muscle fatigue and extends endurance. The stretch in the fabric allows for superior range of motion. The top also features a built-in bra, as well as a 10″ zipper. Zippers can be great on race apparel because it allows for venting should you get over-heated, and opens the top to feel less restricting. There are two pockets that are placed on the sides to avoid catching any water are perfect to hold your nutrition goodies. The top comes in an array of colors: Virtual Pink/Fuel, Tropic/Green Lantern, Indigo/Ice, Black. The collar around the neckline gives the top an added touch of style. Pair with the Zoot Endurance Tri Short to complete the look. Both on sale now at One Tri. There’s certainly joy in helping someone new with triathlon, but these are daunting because there’s so much to talk them through, if they absolutely have no triathlon gear. The first thing I tell anyone is that they need a tri short. I told him to get the Orca Core Sport Pant. This short is excellent for newbies because it has exceptional value and features all the essential triathlon specific short properties – quick drying, has a lighter pad (compared with a bike short), and is made to be worn underneath a wetsuit. The added bonus about this short is that because it’s relatively inexpensive, it’s great for use in brick workouts. This is good, because I’m tired of hearing a triathlete friend telling me that he still uses board shorts to swim in the pool. Click here to see more Orca tri shorts. The Profile Design T2+ Aerobar Extensions uses a system that fits both 26.0mm & 31.8mm bars, making the Profile Design T2+ Aerobar Extensions one of the most practical S-Bend extension on the market! These aero bars are ideal for triathletes and time trialists. These are an excellent replacement if you’re looking a flatter bar that puts you into a more aggressive riding position. Installation for these bars aren’t the most difficult, but you should have some basic understanding of cable routing for your shifters if you decide to go that route. You can also have your local bike shop help you out. De Soto Forza Tri Short – longer, compressive race fabric for muscle support, and comfort. It’s “compressive”. With the “Compressor” fabric, think of the short as having active compression like qualities, which dampens muscle vibration, giving you the muscle support during race day, and in training. Excellent feature for the price point. The pad. The pad construction is good, as it doesn’t make it apparent that you’re wearing a short with a pad in it! The Fabric. It’s comfortable against the skin, and it’s extremely quick drying. De Soto also makes a 4 pocket Forza Tri Short. See more De Soto Tri Shorts. 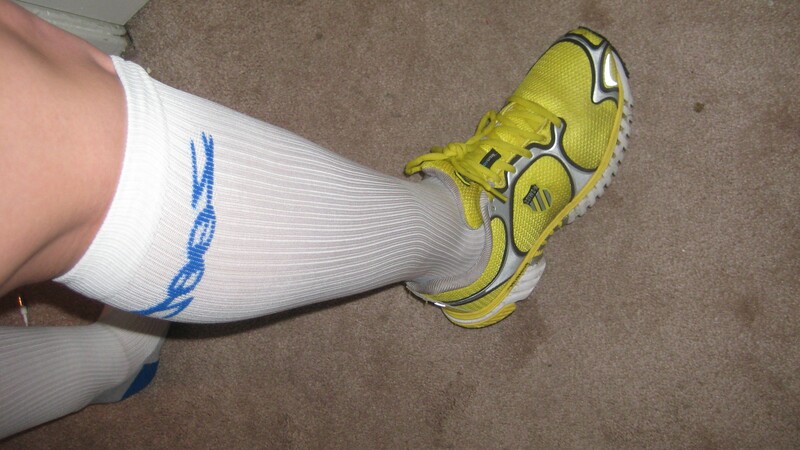 Behold the Zoot Compression Sock. Along the lines of items necessary to your arsenal of tri gear, I would claim it fair to say these should certainly be included. With all the hooplah out there on the market about compression, let’s clear some things up on the science behind it all and why these socks in particular are going to help your performance. Let’s start with the science. Zoot utilizes graduated compression, and more importantly, utilize it correctly. The amount of compression ranges from 26mmHg (mmHg is the unit of measurement used in compression garments) at the ankle and decreases to 18 mmHg just below the knee. The strongest amount of compression is found in the lower part of the leg. This method allows for deoxygenated blood to flow back to the heart. Within the ranges of compression, the 26mmHg falls under medical grade compression. This factor is important when choosing compression. Anything less than 20mmHg isn’t considered medical grade, and will not offer the same benefit. So what is all this doing? The socks help to flush out lactic acid in the veins as well as assist in proper venous flow and return. While running with Zoot CompressRx socks, one is able to get up to 40% more arterial flow in their calf by supporting consistent pressure on the muscle. The compression increases the pressure in the tissues beneath the skin allowing for reduced excess leakage of fluid from the capillaries and increasing absorption of tissue fluid by the capillaries. The goal is to assist the body in doing what it naturally does in flushing damaged muscle tissues. 29% decrease in lactic acid build-up. 25% reduction of perceived effort. 40% improvement in recovery time. These socks in particular can be used as active compression (use them while training or racing) or recovery. Also, keep in mind that they’re perfect for travel use while flying, driving, or even if you plan to be on your feet for a prolonged period of time. The sock is also foot specific with padded foot soles to prevent irritation. Measurements: It’s important that you measure your calf (circumference of the largest part of the muscle belly on your calf) prior to choosing your size. Proper fit will ensure optimal performance.